And then I got this powerful picture – and a powerful surge in my being, a surge of power and of certainty, an epiphany of knowing this is God’s will and God’s direction and planning and desire and purpose, and that He will do this because it is what He wants, desires, purposes (according to His word), and His strength is sufficient and the enemy cannot stop Him! No matter what! If we bow before Him both in humility and repentance and begging forgiveness, and at the same time in total expectation that He will do as He says – that He will enlarge our territory even beyond anything we have ever seen or imagined before, as we give His Spirit free rein to move not only in us but in our church, camp, community, region, world! God will pour out revival that will turn us upside-down, and then turn our world upside-down as we, His church, step out in His Holy Spirit, Pentecost, Jesus-knowing-and-trusting, Father-asking-and-expecting – and desiring – power! Oh Lord, enlarge my vision and enlarge Your territory through me! …. The vision? I saw myself, a little girl, kneeling, with my brother beside me, on the hard floor beside the altar bench that stretched right across the front of the platform in those long-ago Pine Grove Free Methodist Camp tabernacle days, my hands folded. That is what we did when we prayed back then, kneeling, eyes closed, hands folded as we had been taught, because we knew we were addressing a God who deserved our reverence, fear and awe. 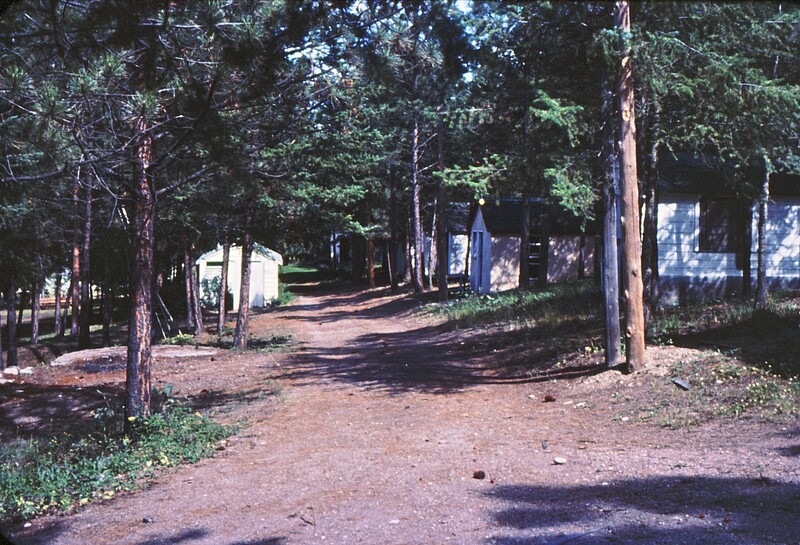 Yet sometimes I would peek at the row of prayer warriors, mostly older men, but Godly women too, who weren’t “just praying” but who were pounding the gates of heaven, who were expecting great things from God for that camp, who knew what God was capable of because they had obviously personally encountered His power; indeed, had encountered Him! They “knew whom they had believed and were persuaded that He is able to keep that which they had committed unto Him against that day.” They knew God, really knew Him, and they knew and respected His power. I was watching and listening to these “giants of the faith,” ordinary men who knew and encountered and expected extraordinary things of an extraordinary God! And they got it! God was there. As a small child, I knew God was there. I didn’t understand it then in some deep theological way, but I knew that when these men prayed, extraordinary things were happening because God was listening and answering! Does anyone else remember those camp meetings, I wonder? Remember those altars, full night after night; remember people weeping and crying for God to forgive them and come into their lives? I know now that not everything was perfect then, that people sometimes went back home, home to their normal lives, and kind of shelved God for another year, putting Him aside until next year’s camp-meeting “fix.” I know there wasn’t always a strong enough rooting and discipling and teaching follow-up ministry and mentoring after camp. I know that, looking back, some people might even remember those powerful camp-meeting altar calls and those powerful prayer meetings with possibly even a touch of embarrassment, thinking that “back in the old days” folks tended to get a bit over-emotional and carried away. And I realize that maybe some folks were just getting caught up in the emotion of the moment, swayed by the old-fashioned power-preaching of those old-fashioned evangelists. And yet, all those so-called old-fashioned, powerful, God-anointed meetings were not just emotional hype. They were the result of men and women of prayer who really knew God; who were taking God’s kingdom with violence, as Scripture says; who knew God in a personally powerful, intimate way, and were not going to let His power get away. And, I also know that we can have that still. We can have it, not just as an occasional event, but as a living, growing, continuous part of our daily lives. We can have it here, now, if we truly want it, if we are willing to repent, if we are truly willing to become humble before God, to cast aside completely our self, and take on “Christ in me.” We must truly repent, not only for ourselves as individuals, but for churches, communities, nations, and for the world. We must reach out to God in expectation, not just hope, coming to know Him, walk with Him, ever deeper and deeper. We must grow into an unbreakable relationship with Him, becoming warriors in His Kingdom, being filled with His purpose that all the world might come to Him and be saved. Back then, my mom would send me, and my brother if he was awake, down to the tabernacle. We were early birds, and she knew our grandpa would be down there. We’d tiptoe in and obediently kneel down beside him, squeezing in, folding our hands, closing our eyes. And there I’d be, peeking between my fingers in wonder at what I was seeing and hearing. Do you wonder that even today, nearly a half century later, those times are etched indelibly on my memory? Do you wonder that even as a teen and young adult, as I was trying to make a wild dash into the seeming pleasures of the world, I could never get away from the God I had encountered back then at my grandfather’s side amidst those old saints of the faith in the early mornings in the tabernacle at the old-time Free Methodist camp meeting? Do you wonder that through the years, I have kept longing and desiring and seeking for more of God, even though all around me I saw a world that seemed only to scorn and reject Him, or, most often, didn’t seem to think of Him at all? I saw a church that often seemed to have lost its moorings, coming adrift in a sea of relativity, seeming to have lost its vision, no longer really understanding, never mind expecting, the extraordinary greatness God intends for His people if only they will truly seek His face, truly long to be transformed and sanctified, truly desire to go into all the world and preach the gospel to every creature. I am indeed fortunate. I have seen and experienced something of that vision, that power, that possibility, that when men and women truly believe, when men get a hold of God, then He turns to them and pours out of His Spirit. And as those men and women open their arms and accept God’s Spirit, and go forth in His power, with no concern for how they might appear to others, what others might think about them, where it might take them, then God will bring them into His wide places far beyond their human experience and expectations and imagination. God wants His church to be HIS church. It has to begin with us, individually and corporately. Are we willing to totally lay ourselves on the altar of sacrifice? The only way into the holy of holies, into the Presence of God, is through the altar of sacrifice. Yes, the sacrifice of our Lord Jesus Christ, His precious blood poured out for our sins. But also our personal sacrifice of ourselves, of all we are and of all we hold dear, as we follow in His footsteps, as we too take up our cross and follow Him, desiring to be like Him in all things, pressing on to the prize of the goal of the high calling in Jesus Christ, pressing on to violently enter the Kingdom of God and bring it to fruition as God as purposed and has revealed in His Word. I want my Grandpa’s encounter with God. I want to experience, encounter, know God every day, the way those old-time Free Methodist believers knew Him. The way my grandfather encountered and knew Him. I can. It can start here, today, on my knees before God in the very spot I knelt beside my grandfather over 40 years ago, here at this camp-meeting place, in this tabernacle, at this altar. I can choose to step out now. Will you join me in the adventure?